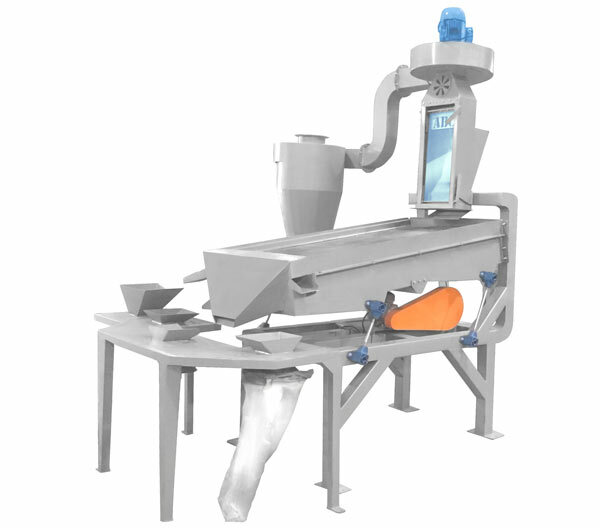 The Quail II eccentric cleaner is used for the removal of most foreign material from the raw product being screened, based on size. The eccentric cleaner removes all particles that are larger or smaller than the raw material being cleaner, including particles such as metal, dust, stones, husk, and sand from the grain. The screening may be followed by an aspiration process whereby all light particles are removed through an air channel. The Quail II Eccentric Cleaner has an easy to remove screen cartridge, making for easy replacement of damaged screens, and for easy switching between different grain types. The cleaning action is achieved when the product is agitated over the top screen, with the larger perforations, by means of an eccentric action on the cleaner body using eccentric drives driven by fan belts. Oversized product flows over the screen and correct sized product passes through the screen onto the bottom screen with the smaller perforations. The under sized product then passed through the bottom screen, whilst the good product runs over the bottom screen. 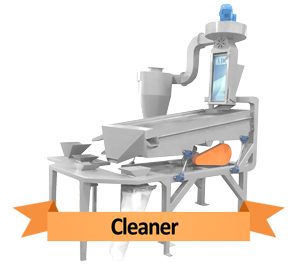 The over and undersized particles (trash) are discharged from the cleaner on either side, and the good product is discharged at the front of the cleaner for easy bag-off or connection to the rest of the process line.